The marijuana job markets are on fire right now, and steady growth is expected in the industry for the next several years. According to a recent study by RCG Economics, annual marijuana market sales in Nevada are expected to be almost $400,000,000 in 2018, and the industry has already brought in over $55 million in tax revenue. If you are among the many job seekers and entrepreneurs looking to get on board, you need to know the Nevada Cannabis Licensing Requirements. Read on to learn about the requirements for business owners and employees. The State Department of Taxation is responsible for the licensing and regulation of retail marijuana business as well as Nevada’s medical marijuana program and recreational marijuana licensing requirements. For those looking to open retail marijuana establishments, there are five licenses available. A cultivation facility license does not allow a business to sell directly to consumers. Distributor License. This license allows an establishment to transport marijuana from one marijuana establishment to another (e.g., from a cultivation facility to a marijuana retail store). This license is limited only to licensed alcohol distributors. This license does not allow businesses to sell directly to consumers. Testing Facility License. With this license, businesses can test marijuana and related products for contaminants and potency. Fees vary based on the license you are seeking. All will include a $5,000 application fee plus a fee of $10,000 -30,000 depending on the establishment. A Marijuana Establishment Agent Card is required for marijuana establishment owners, board members and staff and fingerprint background checks are part of the application process. Click here to view the Marijuana Establishment Agent Card Application and Checklist from the State of Nevada Department of Taxation for details. Agent cards are valid for one year from the issue date, and renewals should be submitted thirty days in advance of expiration. Individuals applying for recreational agent registration would not be eligible to gain a license if convicted of a violent or drug-related felony, or two felonies of any kind in Nevada. If you committed a drug-related or violent felony or two offenses in another state that would be considered felonies in Nevada, you would also not be eligible. Criminal offenses with sentences completed more than ten years prior to application will not count against the applicant. For more information on excluded felony offenses, click here. Regarding medical license applications, a person would be considered ineligible if he or she was convicted of a violent or drug-related felony offense less than ten years ago. This, ironically, would include marijuana offenses. An applicant would be eligible if the sentence for a criminal offense was completed more than ten years ago. You can find additional details on medical marijuana excluded felony offenses here. This Las Vegas Review-Journal article offers some additional details on stipulations and loopholes for excluded felonies for potential business owners. Not just anyone can work or volunteer at a retail marijuana business. There are limitations. First, you must be at least twenty-one years of age. Second, you can’t have past convictions for drug felonies or violent felonies. This does not include convictions that occurred more than ten years ago. In order to work or volunteer at a marijuana business, you must apply for and obtain a registered agent card issued by the state of Nevada. Additionally, you are required to undergo a fingerprint background check during the application process. To learn details about the all current requirements and apply for an agent card, go to the Marijuana Agent Portal and create an account to get started. For a wealth of information on working in the marijuana industry, including what employers are looking for, training programs, how to find cannabis-related jobs, and common positions and pay, check out this Las Vegas Sun article. With recreational marijuana sales just over a year and a half old, those in the industry have to prioritize safety in order to calm the fears of opponents who worry that in will cause a spike in crime. Business owners in the cannabis industry have a strong interest in protecting their products from theft, protecting the public, and providing employees with a safe workplace. While fingerprint background checks are required by the state, it is also important that employers perform due diligence on all potential employees and volunteers by checking past work history, references, and other crimes which may indicate questionable character. By properly screening candidates, employers are protecting not only their businesses but also the industry as a whole. 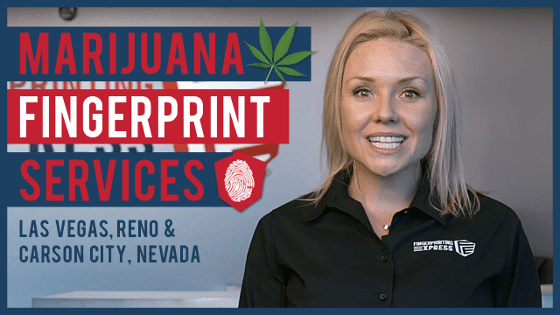 Fingerprinting Express is Nevada’s leader in fingerprint background checks. We work with several employers in the cannabis industry and can send background checks using Livescan, the most advanced electronic fingerprinting available. Livescan ensures results are processed much more quickly without the inky mess of traditional fingerprinting, and employees can have peace of mind knowing that our experts take every measure to ensure that their personal information is protected. We also add an extra level of convenience by offering photos for applications. For employers looking to cover the costs of the photo and background check for employees, we offer employer accounts and a bundle discount rate (in addition to having the lowest fees in Nevada). Note that if your agency has licenses for both Recreational Marijuana and Medical Marijuana, agents will need to be fingerprinted twice. Searching for “Livescan fingerprints near me?” Fingerprinting Express is your one-stop-shop for fingerprinting, background checks, photos, and more! 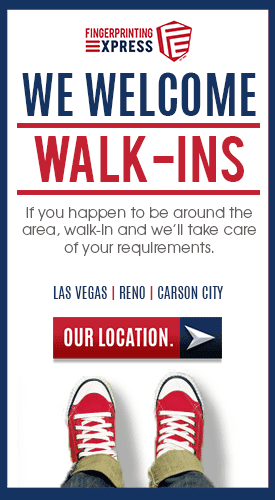 Walk in to any of our four locations or schedule an appointment that is convenient for you.